If you can't decide which flavor to fall in love with, the MacroBar Mini Variety Pack is a great way to sample them all! 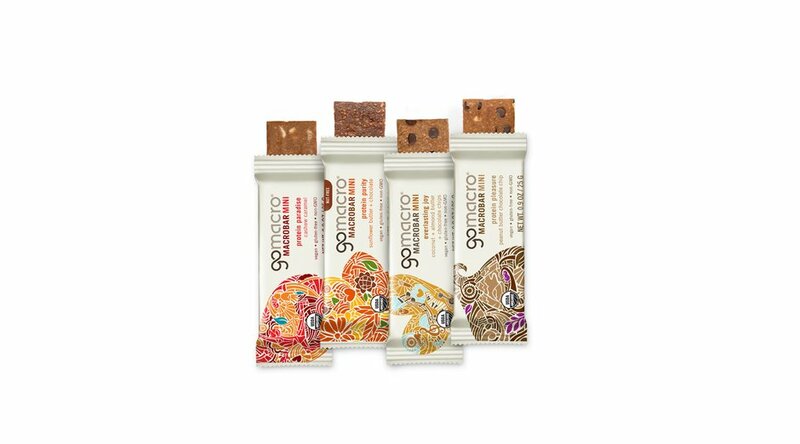 Each MacroBar Mini Variety pack contains 6 bars of each of our top selling flavors including Peanut Butter Chocolate Chip, Coconut + Almond Butter + Chocolate Chip, Sunflower Butter + Chocolate and Cashew Caramel. love these! they're the perfect size to curb my appetite in between classes and during road trips. they fit well in my backpack and i love the different flavors. they're also great for kids! i also like how the size makes it easier for me to eat them as i'm not the biggest fan of chewy bars since they're filling as is. I regularly purchase gomacro bars at the store but haven't been able to find the mini version at the store. For an avid snacker like me, each regular sized gomacro bar entails 2-4 servings for me. I was so happy to find these mini bars online - they are perfect for in between meals, dessert, as a quick preworkout. I am happy with the variety, although I wish they made the peanut butter bar in the mini version. I highly recommend all gomacro bars, not just this variety pack. They have had a positive impact on my overall health - both physical and mental. Love the flavors and the size. Sometimes you just need a little pick me up and these are perfect for that!! I can't find the ingredients list. Am I missing something? Hi Wendy, Thanks for asking-the ingredient list for the mini flavors can be found under the SHOP tab at the top header. There will be a down arrow for the MacroBar Mini option, leading you to each individual flavor. Click on any variety and scroll down to the "What's inside" description, and you will see the Nutrition and Ingredient List box. Thanks! I LOVE these bars! I was buying the RX bars which are good but they do not compare to the Macro protein bars. I just ordered more to send to my brother who is deployed overseas for a year. He will appreciate them as RMEs arent so tasty... Lol... Thank you so much... I plan to be a regular customer!! Very nice size and flavors. Would be nice if a military discount were available. If you are looking for an organic delicious bar that you can take with you everywhere Macro Bar is for you. I ordered the mini sample pack and found the flavors I absolutely love. They fit perfectly in my purse just in case I need a snack. Really like these. Perfect size and good flavor. Filling too. The size of these bars is perfect for a snack before a workout, mid-morning, post-workout, or just on the go! I can't wait until there are even more flavors. Delicious, healthy, and filling! I love these bars! They are the perfect size for a mid-day snack. I found the regular sized bars were sometimes a little more than I needed, so I’m loving these. I ordered the mini sampler pack and I LOVE it. They are the perfect size and the right amount of different flavors. I will be ordering them again! Thanks for such great products!! I love them all except for cashew caramel. I really wish you could buy a box of mini's in one flavor. Sunflower butter + chocolate is my absolute favorite! My 2 year old love sunflower butter + chocolate as well and the mini bars are perfect for him. These bars are delicious. I’ve tried so many different protein bars and they either taste too sugary or no flavor. But these bars are so perfect, they taste healthy and have lots of flavor. I have been telling all my friends to try them. Best tasting bars ever! I purchase the Minibars to include in our Sangha's Blessing Bags for the homeless. They are healthy, vegan, and delicious. I first tried the go macro mini bars at the LPGA golf tournament in Phoenix Arizona. I loved them from the first bite! I could not believe how good they were for being so healthy. The size is perfect and the variety of flavors means you never get tired of them. I would recommend these to anyone! Love the mini's! Perfect for kids or a quick snack at work. Great assortment of flavors, love them all.